Today I’m telecommuting. I love these days. TELECOMMUTING.IS.THE.BEST. So, for Brent’s breakfast this morning I heated up a keilbasa sausage (I had cooked up the package of 4 yesterday, but only used 2 in the recipe I made them for) and scrambled up some eggs. He was a very happy man leaving for work with such delicious food in his belly. We made something with leeks weeks ago. (I honestly can’t even remember at this point what it was, haha!) And there’s been one lonely leek hanging out in our veggie drawer ever since. Also chilling in the veggie drawer: some baby portabella mushrooms, Roma tomatoes, avocado, onion, etc. Well, knowing that leek needed to be used because I HATE wasting food, I decided to say “maybe another day” to the keilbasa and find a way to use that. 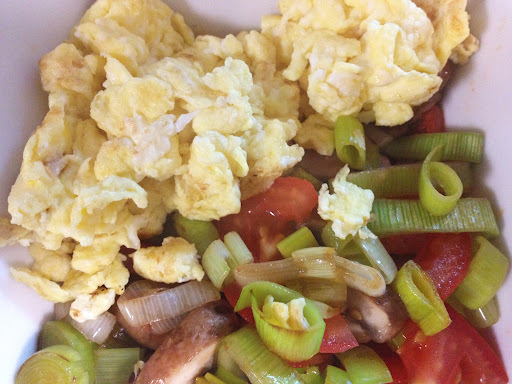 Here is what I came up with: a sauteed mixture of leek, mushrooms and tomato served with eggs. This was super easy and fast, and best of all, it came out delicious! First, make sure you rinse the leeks and mushrooms well under cold running water in a strainer. Leeks tend to have little gritty stores of sand between the layers, and it’s best if you try to separate the layers while rinsing the slices to make sure all that washes away. 1. Melt the bacon fat in medium skillet over medium-high heat. 2. Toss in the leek and mushroom slices. 3. Sauté until soft (about 3-5 minutes). 4. Add the tomato slices and continue to sauté for about 1 minute. 5. 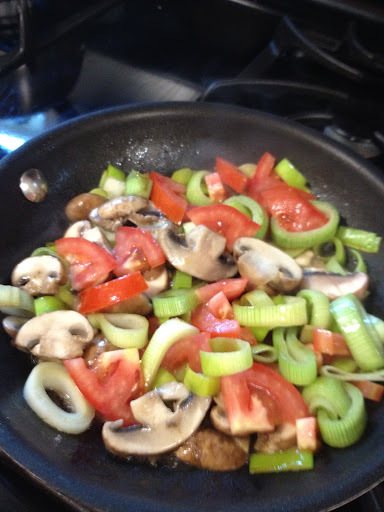 Put your sauté mixture on your plate or in your bowl, leaving a small amount of the juices in the skillet. 6. Scramble your eggs in the skillet. 7. 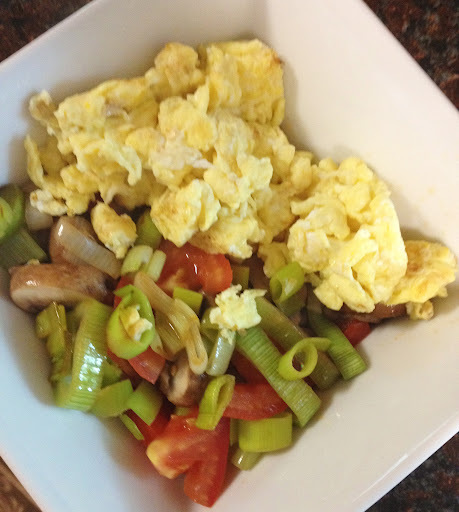 Put the scrambled eggs on your plate or in the bowl with the sauté mixture. Now, you’re ready to eat. 🙂 Enjoy!